There’s an area of the house that rarely gets attention. It’s used as a storage unit. It protects cars from rain, wind, snow, and sun damage. It might even be home to an extra refrigerator or freezer. Yes, we’re talking about the garage. A lot of people may not tend to think about the appearance of the garage. But, believe it or not, custom garage flooring could really take that are of your home to another level! Why Get Custom Garage Floors? There are plenty of reasons why you should think about getting custom garage flooring. First of all, the garage is usually thought of as a place to put all the extra stuff you’ve got. But, it doesn’t have to be! In fact, the garage can be a great place for people to hang out. It can basically be an additional living space for your home. Lots of people turn their garages into den areas, where friends can enjoy each other’s company. Getting custom garage floors can allow you to make this new room a great place to entertain guests. You can also make the garage into an office space. If you need a little peace and quiet as you work on your next big project, a renovated garage could be just the place for you. Keep in mind that, if you have a garage which can fit multiple cars, you can convert only part of the garage. Many people change a 3-car garage into a 2-car garage, using the other part of the space as another room in the house. This is a great idea if your family is growing or if you just need a little extra space. Maybe, you’re not interested in turning your garage into a hangout spot. Remodeling this area isn’t just about expansion. Sometimes, just as it does inside of your house, the floor can get a little worn. 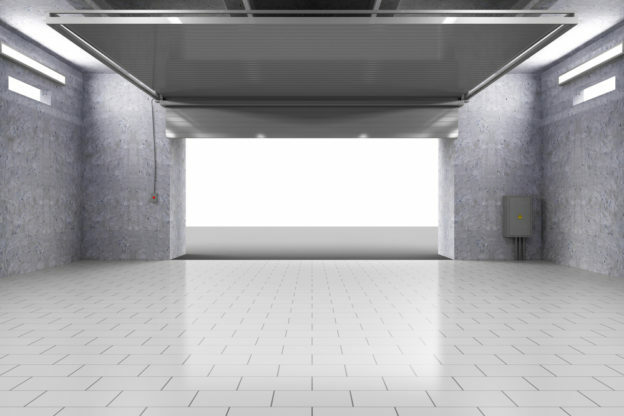 The constant weight of your vehicles, oil leaks, and lots of other things can have a bad impact on your garage floors. But, you can change that when you get custom garage flooring. What Kinds of Flooring Work Best? Tile: Good old tile is always an idea. It’s versatile, as it comes in various colors and patterns. Some people even choose sturdy, stone flooring for their garage space. Whatever tile you choose, you can create an awesome new look for your custom garage floors. Epoxy: This is a common choice for custom garage floors. Epoxy flooring is durable and long-lasting. This kind of flooring comes in several different colors and can be mixed with different colored chips to create a great hue or texture. It’s resistant to most chemicals and liquids that may spill on it. So, say goodbye to ugly garage floor stains! Paint: What if your current flooring is already well-kept and free of any cracks, stains, or other types of damage? You got it! Save some money and simply paint your current floors! This is a great DIY method for custom garage floors. Plus, it allows for creativity and a large spectrum of color opportunities. Do you think your garage could use a little remodeling? If so, then you’ll need to get rid of the flooring you have right now. The team here at Dust Busters Floor Removal has lots of experience removing several different types of flooring. We work quickly and efficiently so you can move on to the new flooring you’ve been wanting in your home or business. Ready for a change? Call Dust Busters today!